This sampler was worked in 1828 [or 1825] by Ann E. Kelly at the Harrisburg, Pennsylvania, school of Leah Maguire. The central scene is either biblical or classical, and was undoubtedly inspired by a yet to be identified print source. It depicts a woman holding a long garland of flowers who appears to making a burnt offering to a deity. At her feet is a pitcher, and beside her is a pedestal on which sits a smoking vessel. The sampler’s border is made up of compartmentalized motifs, including flowers, birds, sheep, sheaves of wheat, a basket of fruit or flowers, a scene with a house and tree, and an inscription. Anne E. Kelly’s work is part of a group of related samplers produced in Lancaster, York, and Dauphin counties between 1797 and 1838. These striking works probably originated under the instruction of Leah Galligher (later Maguire), who was born Leah Bratten in 1764 near Wilmington, Delaware. Leah married schoolmaster Francis Galligher in 1791, and in 1797 she opened a girls’ school in Lancaster. Early samplers naming Mrs. Galligher’s school feature borders of compartmentalized designs encircling inscriptions and alphabets. 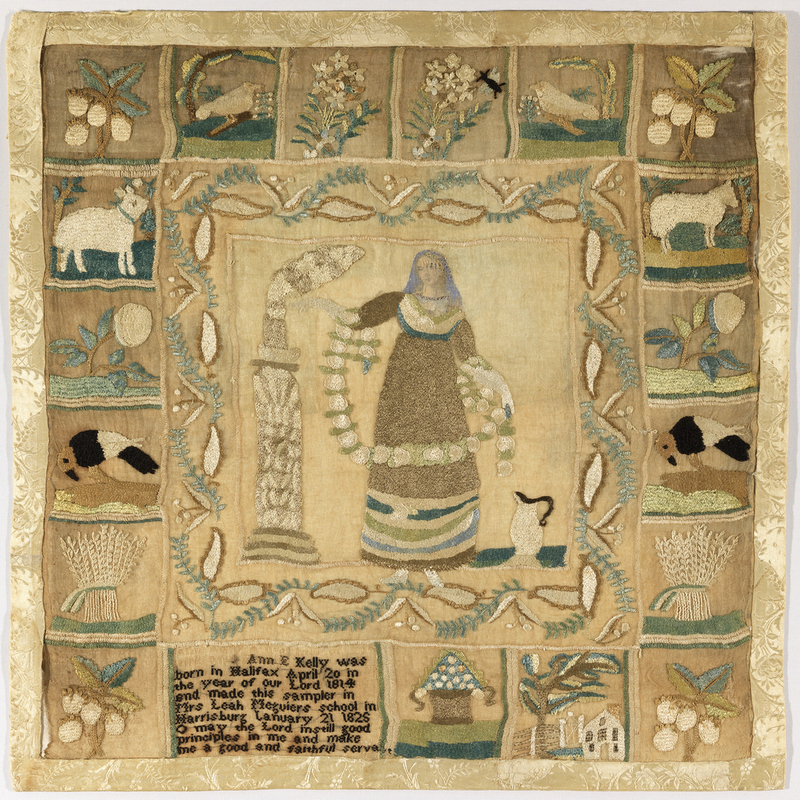 A sampler depicting a woman holding a garland, worked in 1800 by Dolly Sheller (1791–1867) and now in a private collection, is a precursor to the pictorial style that Leah would later develop. In 1802, after initiating a bitter and public divorce from her husband, Leah relocated to Harrisburg. There she continued her needlework instruction, marrying shoemaker Isaac Maguire in 1805. It was in Harrisburg that Leah fully developed the sampler pattern that would be imitated throughout the area by instructresses like Catherine Welshans Buchanan (1792–1852). Elements of these later works included pastoral scenes, borders of compartmentalized decoration, and the use of paint, human hair, and metallic thread. Ann E. Kelly’s sampler is one of the latest to name Mrs. Maguire, who died in 1830. Related samplers from Mrs. Maguire’s school, worked by Rachel Geiger in 1806 (private collection), by Elizabeth Finney in 1807 (private collection), and by Catharine Boas in 1812 (location unknown), also feature pictorial scenes and borders of decorative motifs enclosed in squares. Ann E. Kelly was born in Halifax, Pennsylvania, on April 20, 1814. She was the daughter of Patricius Kelly and Nancy Gervy. Ann’s family was Catholic, and she was baptized Conewago Chapel in Adams County. Given the Kellys’ surname and religion, it is possible that they had emigrated from Ireland.